These chipmakers can deliver solid long-term gains despite short-term hiccups. The PHLX Semiconductor Index has turned in an underwhelming performance so far this year as fears of a cyclical slowdown and other macro obstacles have hurt investor sentiment. The latest developments suggest that things won't get better anytime soon. Deutsche Bank recently slashed the earnings estimates for eight chip stocks by an average of 5%, blaming a slowdown in business activity. Morgan Stanley is singing a similar tune, believing that an inventory correction in the space will boost bearish sentiment and hurt stock prices. But investors who are willing to absorb the near-term pain and take advantage of secular semiconductor trends over the long run should keep Skyworks Solutions (NASDAQ:SWKS), Xilinx (NASDAQ:XLNX), and Maxim Integrated (NASDAQ:MXIM) on their radar. Let's see why. Skyworks Solutions looks well prepared to overcome the industry downturn thanks to its strong margin profile. In fact, all three companies discussed in this piece carry this trait. 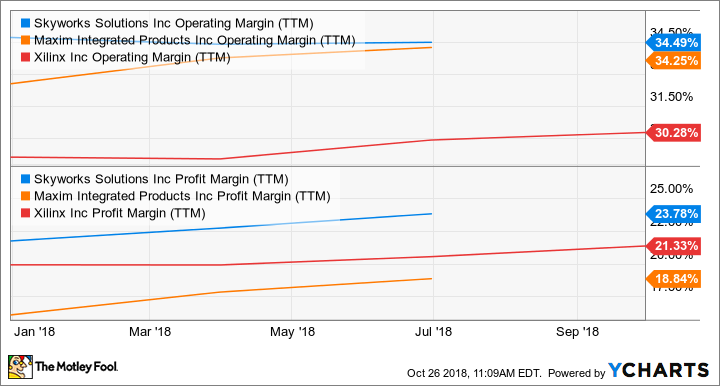 For comparison, the average operating margin of the semiconductor industry is around 27%, whereas all the ones in the chart above are over 30. Skyworks is at the top of this list and it won't be surprising if its margins get better on account of favorable technology trends in smartphones and the Internet of Things. Carrier aggregation -- which increases bandwidth -- for instance, will give Skyworks' business a nice shot in the arm as it supplies necessary technology. Looking ahead, demand for Skyworks' aggregation switches will increase with the advent of fifth-generation (5G) cellular networks. That's because 5G networks require the aggregation of a wide range of spectrum bands from 30 GHz to 300 GHz as compared to the 4G network that uses frequencies below 6 GHz. Considering that 5G smartphone shipments are forecast to increase from just 2 million in 2019 to 1.5 billion in 2025, it can be safely said that Skyworks Solutions is sitting on a massive opportunity. Just like Skyworks, demand for Xilinx's programmable chips is going to take off thanks to their application in artificial intelligence (AI). It is estimated that the market for FPGA (field-programmable gate array) chips that Xilinx deals in will be worth $12.1 billion in 2024 as compared to $6.9 billion at the end of 2016. Xilinx is in a solid position to take advantage of this growth, as it controls nearly 60% of the FPGA market. Intel holds the remaining market share in this space, and it is likely that it could lose more ground because of a delay in its 10-nm (nanometer) production process. Xilinx is all set to launch its next-generation FPGAs based on the 7-nm process next year, while Intel's competing 10-nm platform will probably hit the market in 2020, assuming that there are no further delays. Ideally, Xilinx's chips based on a smaller manufacturing node should give it a leg up over Intel. That's because a smaller nanometer indicates that the chip is made using an advanced process, which allows for more processing power and lower power consumption. As such, Xilinx can widen its technology lead over Chipzilla, as the latter will remain on the 14-nm manufacturing process for at least two years. In all, Xilinx looks set to corner a bigger share of the FPGA market. This is one of the reasons why the company's earnings are forecast to grow at a compound annual growth rate of nearly 16% over the next five years. This marks a terrific improvement over the 4% annual earnings growth that Xilinx has recorded in the past five years. Maxim Integrated has managed to get its growth back on track of late thanks to the growing clout of its automotive business. Its revenue increased 8% in the recently concluded fiscal year, which marks an improvement over the 5% annual revenue growth it clocked in fiscal 2017. The good news is that Maxim believes that its automotive business will grow in the low teens going forward. The automotive business supplied 22%, or $139 million, of Maxim's total revenue during the quarter ended in June. This translates into an annual automotive run rate of $556 million. Using a 13% growth rate (the company's low-teens estimate), Maxim's annual automotive revenue could exceed $1 billion in the next five years, nearly double where it stands right now. Given that Maxim has generated $2.48 billion in revenue in the trailing 12 months, the automotive business looks all set to give its figures a nice boost in the future. More importantly, Maxim is in a solid position to grow the automotive business thanks to its partnerships with the likes of NVIDIA. Maxim's integrated circuits have been chosen by NVIDIA to power its advanced self-driving car systems, including the DRIVE Pegasus and the Xavier platforms. The good news for Maxim is that NVIDIA's autonomous driving platforms are witnessing higher engagement levels thanks to its solid ecosystem of partners. Maxim's long-term prospects appear rosy. In the end, we can conclude that all three companies could deliver nice gains to investors in the long run despite short-term hiccups, thanks to their reliance on secular growth trends. That's why investors should hold tight and possibly accumulate these three stocks if they show signs of short-term weakness.